If you have an old bicycle or you’ve found a vintage cycle at a garage or estate sale, you may want to restore it so that it looks as beautifully shiny as it did when it was new. Bicycle restoration can help to turn an old, rusty bicycle frame into a work of art. If you use spray chrome for your bicycle restoration, you can add mirror-like finishes to parts of the frame or to the entire frame. This can make your bicycle truly unique, and it will draw attention as you ride it around. Here is what you’ll need to do. If you have damaged or rusted areas on your bicycle’s frame, you’ll need to repair the damage. For rusted chrome parts, you can remove the rust by placing the part in water. Then, using either chrome polish or WD-40, you can remove the rust with your steel wool or a wadded-up piece of aluminum foil. Some people claim that the foil works better. After you’ve removed rust, you’ll want to sand the bicycle’s frame using your sandpaper. Sand the surface until it is smooth. If there are any gouged or dented areas, fill them with filler. After it dries, re-sand so that the filled area is flush and smooth. Finally, apply your primer all over the frame. There are several steps in the spray-chrome process. Begin by mixing your solutions. To each of the S, R and D concentrates, mix 30 milliliters of water to one part of each concentrate and store in the separately provided bottles. Mix four parts of your W solution together with 30 milliliters of water. Set these solutions aside. Next, you’ll mix your basecoat. Mix one part of your 2KA basecoat together with one part of your 2K hardener. To this mixture, add 20 percent of your black 2K reducer. Then, spray the base coat on the bicycle frame using quick side-to-side passes. Make sure to thoroughly clean your spray gun with paint thinner or acetone. After your basecoat has dried and cured, your next step is to use your sensitizing solution, which is the one that is marked ‘W’. Spray it liberally over the frame’s surface. Immediately follow that with an application of your D solution and rinse it with deionized water. Repeat this process, again rinsing with deionized water. Without allowing your frame to dry, immediately apply your spray chrome, which are the S and R solutions contained in the double-bottle sprayer or the dual-nozzle spray gun. Make quick passes, moving from the bottom to the top, and reapply until you have the desired shine. Blow off any water droplets that remain on the surface. Your topcoat mixture should contain equal parts of 2KA topcoat and 2KB hardener mixed together with 20 percent of your clear 2K reducer. Add 1 milliliter of violet to every 125 milliliters of your topcoat solution to prevent a yellowing effect. Spray your topcoat on, again working from the bottom to the top. Your topcoat should be cured in 48 hours at room temperature. 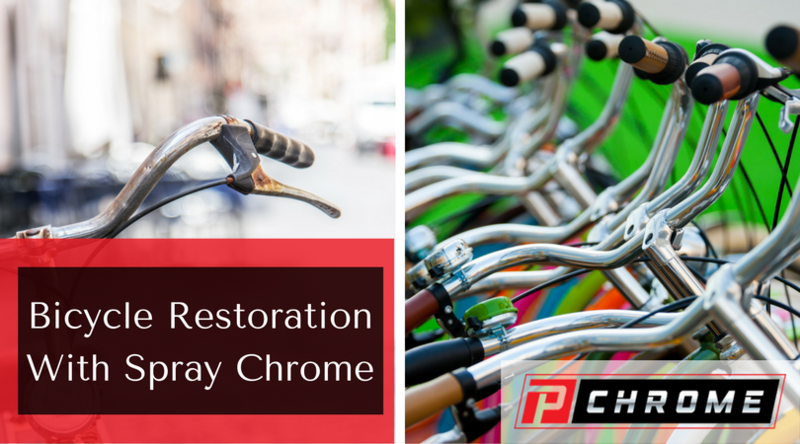 When you are ready to begin your bicycle restoration project, PChrome is here to help. Order your kit today by calling us or via our online order form.